Dressed in colorful robes and uniforms, thousands of people marched through the streets of Amsterdam to the Oostpark to celebrate the abolition of slavery in the Dutch colony of Suriname. It was a colorful march on a day with mixed weather. Over and over again the gathered crowd of thousands of people was surprised by short showers of rain. But this could not affect the atmosphere of happiness among the revelers. ‘Keti Koti’ is of Sranan origin and is a word from the in Suriname spoken Creole language. It means “ the chains are cut” and stands for the Emancipation Day in Suriname. 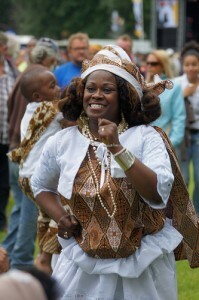 During that day, people celebrate the official abolition of slavery in the Dutch colony on the 1 July 1863. During the Congress of Vienna in 1815, eight European powers first declared their opposition to slavery. In the final act they openly condemned slave trade but in fact slavery still existed. The British colonialists passed the British Slavery Abolition Act in 1834 and when it came into force, slavery was abolished throughout most of the British colonies. In Dutch Suriname and the Antilles, slavery was abolished about 30 years later. Still today, people celebrate the first of July in memory of the abolition of these devastating days of history. 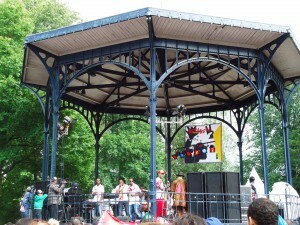 During this year’s Keti Koti Festival in Amsterdam a big line up of mainly Surinamese artists and bands were firing the gathered audience on three stages. 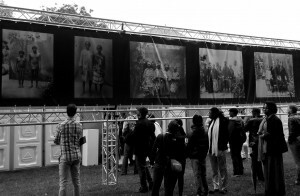 Besides an extensive music and dance program, the organizers also presented a monument and a photo series of the past days of slavery in the Dutch colonies. Among the speakers during the official memory part of the festival was former Prime Minister of the Netherlands Mark Rutte, Ministers of Curacao, St. Maarten and Aruba, the ambassadors of Suriname, Ghana and South Africa as well as the mayor of Amsterdam. The fact that ambassadors of two African countries with a pregnant colonial history were invited to speak, shows that the struggle for the abolition of slavery was and still is a worldwide phenomenon. Particularly African countries suffered a lot under foreign occupation and human exploitation during the era of colonialism. All in all, this year’s Keti Koti Festival in Amsterdam was characterized by a lively atmosphere and the organizers succeeded again in attracting thousands of people to the annual memory of the abolition of slavery in Suriname by the Dutch colonizers.